Last time I wrote about toad in the hole I told a tale about a manic frog throwing contest and I’m not sure I can top this today. When I introduced Ted to Toad in the Hole, you can imagine he found the name very funny and it’s been pencilled in on the menu for our next play date supper. I’ve had it in my head – blame Delia probably – that toad in the hotel, sorry, I keep typing hotel by mistake, is more complicated to make than it is hence it’s a full five years since that earlier blog post. I’m not sure where the name comes from as there are neither toads nor holes especially nevertheless I have vowed to make this low effort dish more often. 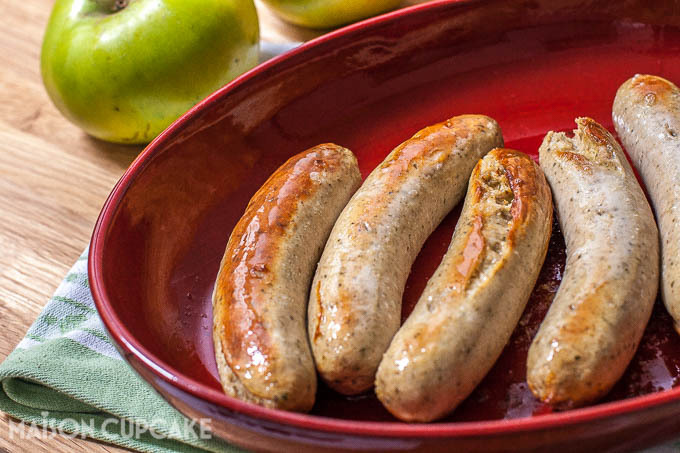 You could have the sausages slammed in the oven within two minutes and then just tip the batter on them once they’ve browned and leave to bake a little longer. 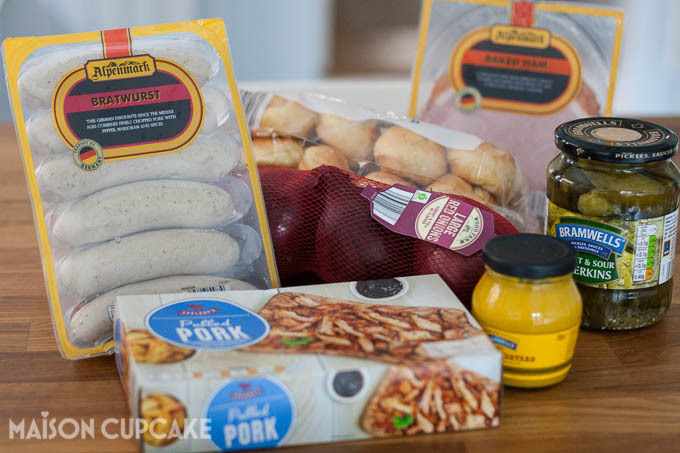 The sausages in question were these Bratwurst as previously shown in my Aldi roast tomato soup post last month. They’re generously sized and possibly the best supermarket sold sausages I’ve had. I had intended to pay homage to my Germanic roots with some curry wurst but they’ve ended up as toads instead. The sausages need to be started off first, I baked these in a hot oven for 15 minutes so they weren’t anaemic and then poured over the batter. 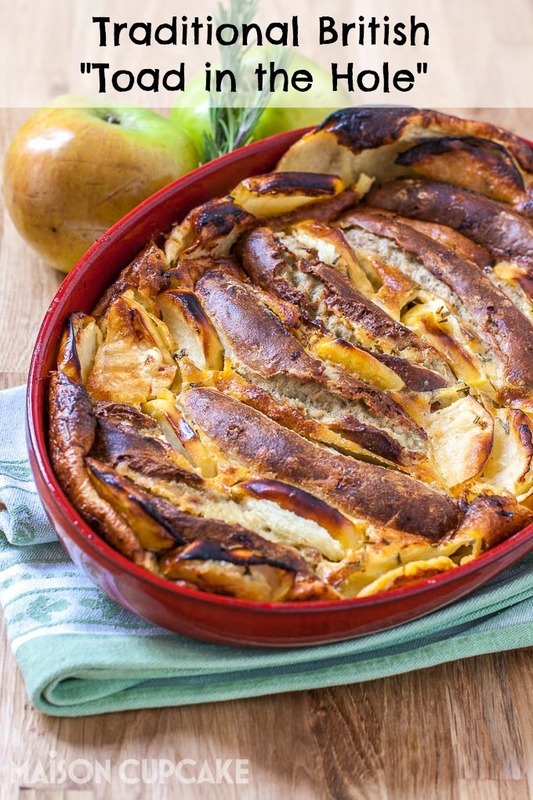 The added pizzazz to this toad in the hole comes from Bramley apples in order to celebrate Bramley Apple Week. I was challenged to make a recipe using Bramley Apples that didn’t rely on added sugar. It’s a misnomer that Bramleys are completely sour and always require added sugar. I was pleasantly surprised that these did not and tossed them in some hazelnut oil and chopped rosemary before popping them in the dish with the sausages. 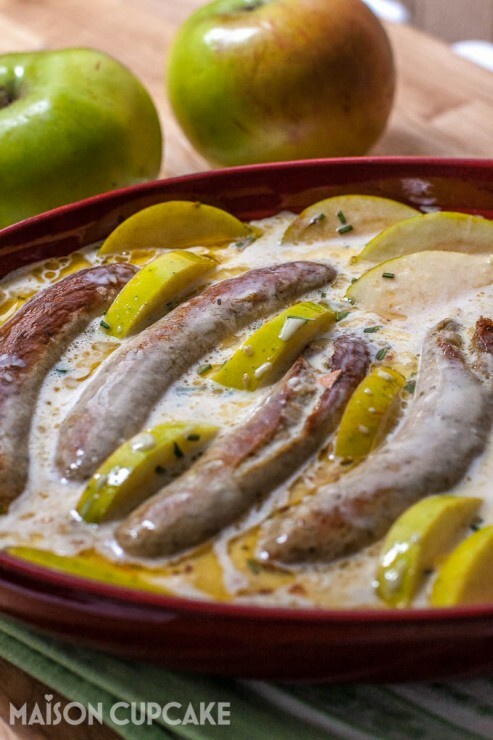 The raw Bramley apple slices were simply arranged between the cooked sausages and then the batter poured over. (Yes I see there’s a triangle of egg shell on the right hand picture, I promise I picked if off before cooking!) Twenty minutes’ further baking in a hot oven and our toad in the hole was ready to serve. 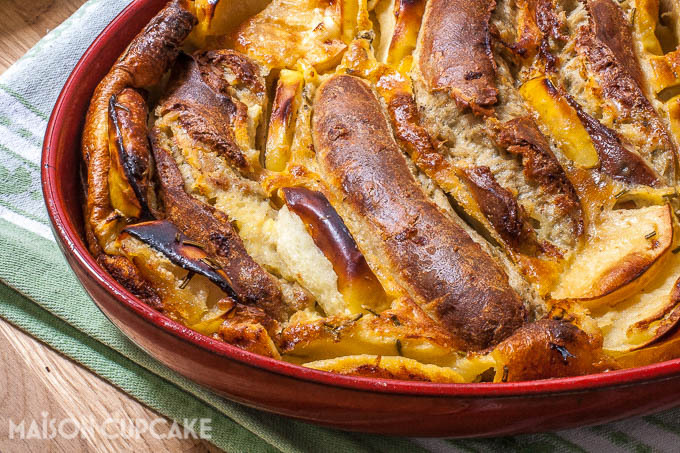 Have you ever tried cooking Bramley apples without sugar? 1. Preheat the oven to 220c / Gas 8. 2. Lay the sausages in a large ovenproof dish and dot with half tablespoon of butter. Bake for around 10-15 minutes until lightly bronzed. 3. Meanwhile mix the batter in a medium size mixing bowl by beating the milk, flour, eggs and pinch of salt together. When smooth beat in the molten butter and set aside. 4. 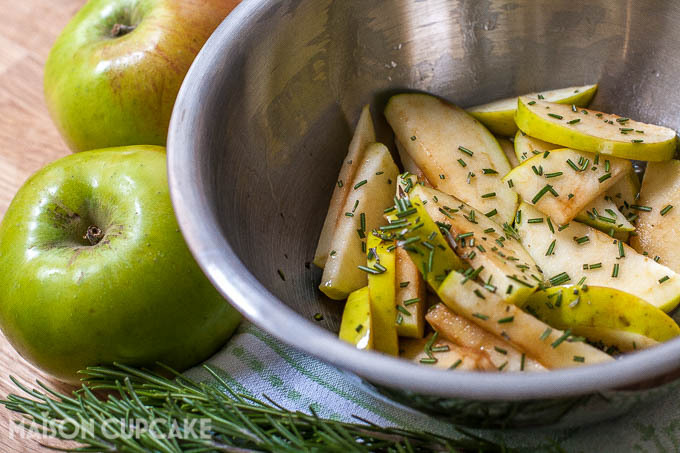 In a small bowl, toss the apple slices in the oil with the chopped rosemary. 5. 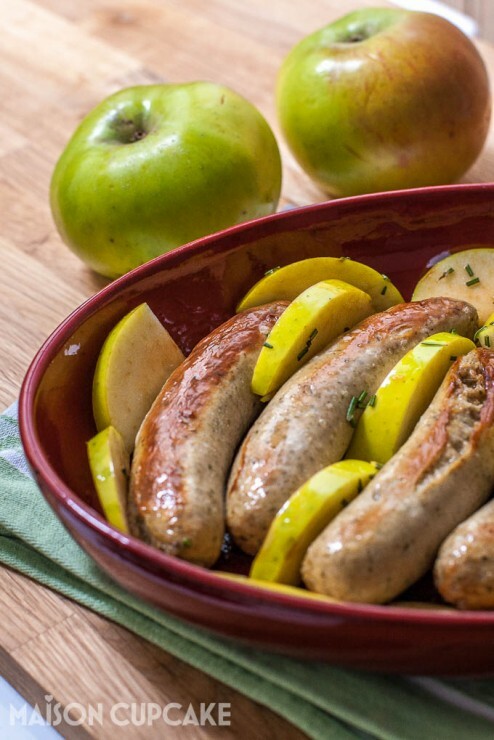 When the sausages have turned a pleasing colour, arrange the apple slices around the sausages and the edge of the dish. Scrape any oily rosemary bits over the sausages so not to waste them, pour over the batter and return to the oven for a further 15-20 minutes. When the batter has puffed up and the sausages had ample time to cook it’s ready to serve. Tip: keep an eye out that the toad in the hole is not getting scorched. If necessary lower the shelf and/or cover with foil. « Turtle Bay Walthamstow: Happy Hour on the menu! Definitely to make this, I wonder if ready made apple sauce would be too sweet. Nice pics. Thanks Solange – it’s as easy to cut up a bramley apple as it is to open a jar, I’d recommend using the real thing. 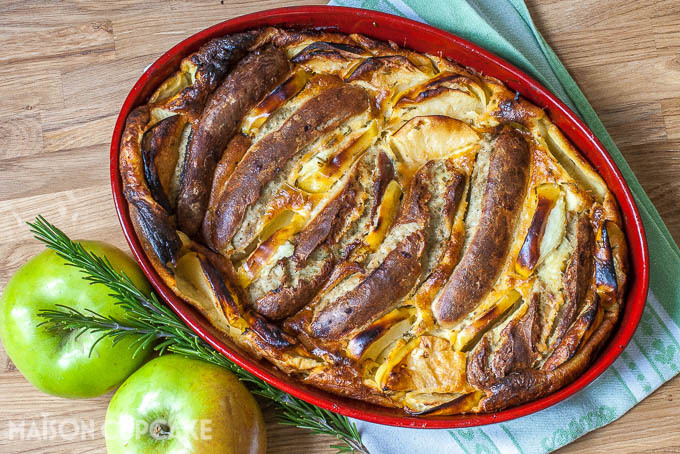 Toad in the hole is a fabulous comfort winter dish and adding Bramley apples into the sauce can only make it better ! Beautiful Photographs too Sarah. Thanks Manjiri, it just needs gravy now! This really does look like my perfect comfort food. Love the photos too! Such a brilliant idea. I would never have thought if this but I totally get it. Those apples would have tasted incredible!! I would totally have a toad in the hotel please. I have actually never cooked Bramley apples without sugar and I am keen to try tarte tartin with a twist with them. Ha ha toad in the hotel can probably be arranged if you visit one of the cheaper establishments on laterooms dot com!! That looks perfect, Sarah! The flavours sound dreamy. Stunning photography too.